Join your OD colleagues at Millennium Park for the OD Network of Chicago Annual Meeting, great music, good food, drink, and conversation. NOTE: This event replaces our usual monthly program and it occurs on a Wednesday night. There is no fee for this program, but we do expect you to bring food or drink to share with others. Please note the city’s new security measures at the end of this message. 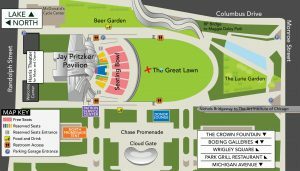 We will be meeting near the north side of The Great Lawn in the Pritzker Pavilion, Millennium Park. See map below…X marks the spot (but it may be too small to see here). Bring a blanket or chair along with your food/drink items to share. The new board of directors will be announced, we will thank Mark Kaufman for his service as President during the past years, and we will talk about ideas for future programs and activities as we enter a new fiscal year. Any questions? Contact us at admin@odnchicago. org or call Maggie Shreve at 312.730.0041. 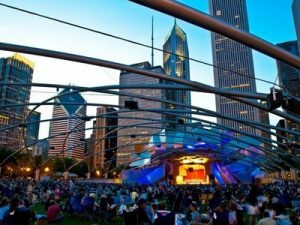 The City of Chicago has implemented a new security perimeter and bag check policy for all concerts at the Jay Pritzker Pavilion. For a complete list of prohibited items, visit gpmf.org/prohibited. Please note that metal knives, in particular, are not allowed in the Park. For most Festival concerts, entrances and security check lines will open two hours before the concert begins. All patrons are encouraged to arrive early.